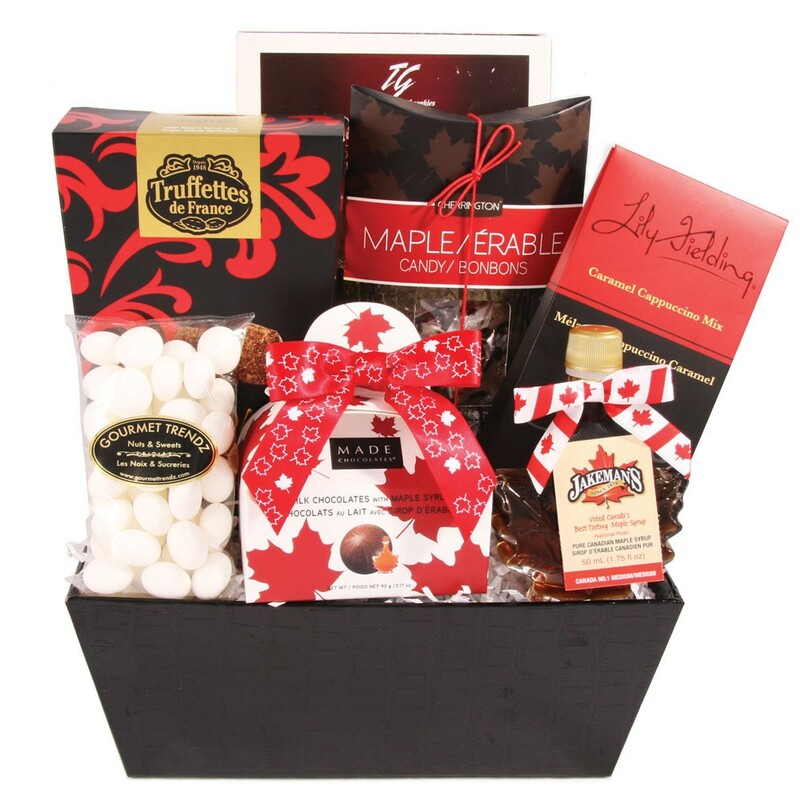 Enjoy a little taste of Canada with this selection of sweet maple products. Cocoa truffles with maple syrup, milk chocolate truffles with maple syrup, maple candies and other goodies are accented with a bottle of pure Canadian maple syrup. Our standard delivery fee is charged for orders that are delivered same-day if ordered before 11:00am EST. These orders will be delivered throughout the day (usually in the afternoon). NO TIME GUARANTEE is available for this option. Cut off time: Mon - Sat 11:00 am. Orders received after 11:00am EST will automatically go for delivery the following business day. This option allows for 3hr EXPRESS delivery. Orders will be delivered within 3hrs of receiving the order when ordered between 9:30am and 2:00pm EST. Please select this option if you have any time preference for delivery. Orders must be placed before 2:00pm for same-day express. If you would like rush delivery after 2:00pm please call 1 800 387-9557. Please select this service to have your order delivered by 12:30pm EST. Express Shipping is available Mon - Fri.
Our standard delivery fee of $17.99 is charged for flower orders that are outside our local GTA delivery area. This includes any delivery outside our local GTA area, across Ontario, Canada and USA. We ship all our gift baskets from our location. Please select the UPS option. Prices will vary based on location. At Epic Baskets, we aim to make the gift basket as similar as possible to the one you see pictured. Each gift basket is custom-made by our talented designers. With our best efforts the actual gift basket may not precisely match the photo, but its overall appearance will. Occasionally, substitutions of products or containers must happen. This could be due to seasonality, market conditions, or weather which can affect availability. If this is the case with the gift you've selected, we will ensure that the style and theme of your gift basket is preserved and will only substitute items of equal or higher value.